The new and improved Land Surfer stunt scooter is a perfect choice whether you’re in the skate park or on the way to school! A lightweight and robust frame with a reinforced 360° swivel flat rail plate gives the agility necessary for tricks, while still being strong enough to be safe when landing tricks in the skate park. 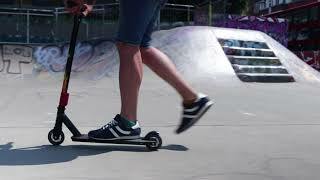 The Land Surfer stunt scooters are available in a wide range of cool and eye-catching designs and are delivered in retail packaging with a convenient carry handle.